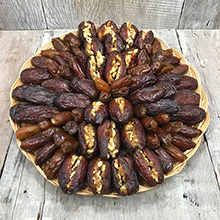 Our trio of mouth-watering dates - Jumbo Medjools, Deglet Noors, and Walnut-Stuffed Jumbo Medjools - are all hand-selected at the peak of ripeness, and are sure to bring everyone back for more of this delightful trio. Packaged in a 48 oz. woven tray.